Keep hearing about Google Chromecast Streaming Media Players but not sure what all the hype is? Check out these 4 reasons to love the Google Chromecast Streaming Media Player. We’ve had a Google Chromecast since the first generation. I love that they just keep getting better and better with each new model yet still don’t break the bank. 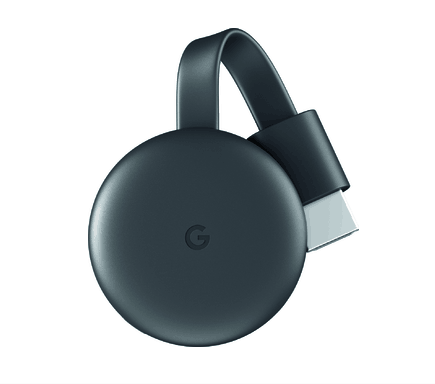 For example, the latest generation of Google Chromecast Streaming Media Player is available for just $35 at Best Buy (as of 10/12/18). Here are 4 reasons to love the Google Chromecast Streaming Media Player if you’ve been on the fence about purchasing one for yourself or the whole family. 1. You can stream from your smartphone (and many other devices) right to your TV. I remember even with the first generation of Chromecast it was so cool to be able to stream from your smartphone to your TV almost like magic. These days there are a ton of devices you can easily stream from whether it’s your phone, tablet, laptop, desktop, etc. It’s just so much more comfortable, especially when watching with the whole family, to be comfy on the couch and watching on the big screen. 2. It works with the streaming apps you probably already use. The Chromecast was pretty basic when it came to apps originally but now it works with over 2000 apps like Netflix, YouTube, YouTube TV, and HBO NOW. You can find more apps the latest Chromecast works with at g.co/chromecast/. Some apps may require an additional subscription cost. 3. You can even start streaming with just your voice. All you have to do is just say what you want to watch from compatible apps. Thanks to Chromecast and Google Home working seamlessly together you can control your TV hands-free. 4. It’s already compatible with your existing HDTV. Even if you have an older HDTV you can likely use and give it an upgrade with the latest Google Chromecast. All you need to easily connect is an available HDMI port. The Chromecast has built-in Wi-Fi connectivity, so as long as you have a wireless home network you can start streaming to your TV quickly. Chromecast was made to make the most of your favorite apps and entertainment you already use on your phone. Whether it’s TV shows, movies, live TV, YouTube, photos and more – it’s all just a tap away from all of you and your family’s devices. Head over to BestBuy.com to upgrade the TVs in your home with the latest Google Chromecast.